Our behaviour in our own homes - our recycling habits, consumer choices and transport preferences - all have a huge impact on the environment locally and globally. Governments across the world are trying to formulate and implement policies to encourage and enforce more sustainable household actions. Yet so often these policies fail to have the desired effects because of a lack of understanding of the complex interplay of policy and individual behaviour. This book examines this interplay, looking at the role of values, attitudes and constraints in the links between policy and changing behaviour at the household level. 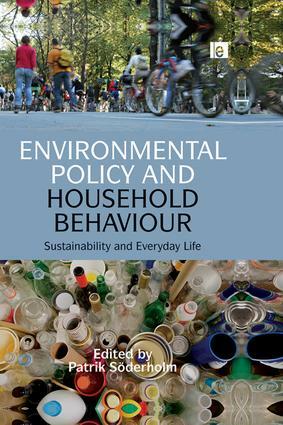 The first part of the book explores the theoretical background looking at the politics of lifestyles and lifestyle change, policy legitimacy and barriers and facilitators for pro-environmental behaviour. The second part is made up of in-depth case studies from Sweden - one of the fore-running countries in this area - examining three main types of household behaviour: waste and recycling; consumption and labelling; and transportation choices. Within these case studies, the contributors examine what policy initiatives have and haven't worked and the role of values and constraints in those processes. This is the first inter-disciplinary, in-depth look at how environmental policy enters the private, domestic sphere. The theoretical insights and policy guidance the book offers will be vital in the drive to generate behaviour change at the household level and the move towards sustainable societies.